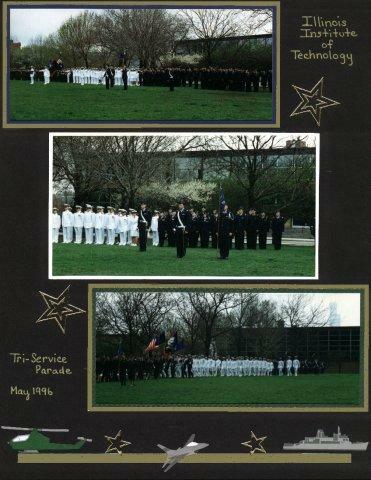 I matted each of the photos on a different color of paper (blue, white, and green) to keep with the tri-service theme, matching with the colors of the uniforms. I matted the blue and green ones again in gold to make them stand out against the black. For the border, I just cut a thin strip of the gold paper, and arranged stickers from each of the appropriate Mrs. G's design lines - Army, Navy, Air Force. Added Class-A-Peels star stickers and journalling with gold pen.